Let’s talk about fish. We are all are living in a time where we know how important it is to eat fish because of all the amazing things it does for our bodies. Most notably are the Omega- 3 fatty acids, which are simply fantastic for our bodies. Unfortunately, it is not always on the top of our list when we are thinking of quick easy meals to make on the weeknights. When I cook fish of any kind for dinner, my day becomes bombarded with looking up good recipes, and grocery shopping for all kinds of things that I absolutely don’t have in my pantry and probably will never use again (which is my pet peeve because I can’t stand wasting food). Salmon always seems to be one of the most difficult fish to prepare, because of its unique flavor. About a month ago, I went to Costco and noticed that they sell a fresh farmed Atlantic salmon fillet that has the skin removed. This purchase was a bit of a commitment because it only comes in a large fillet that is about 2- 2 ½ lbs. That week we had salmon 3 out of the 7 nights and absolutely loved it. Everyone was very pleased, but I was still working hard on trying to find a way to eliminate buying a bunch of extra ingredients. So the other night, when I was just too tired to shop, I went through my fridge and used things I already had, and came up with this wonderful quick salmon dinner. I was pleasantly surprised with the results, and I just had to share my findings. I hope you enjoy it! 2. Put two salmon fillets on a foiled pan and add salt, pepper, and garlic powder to your liking. 3. 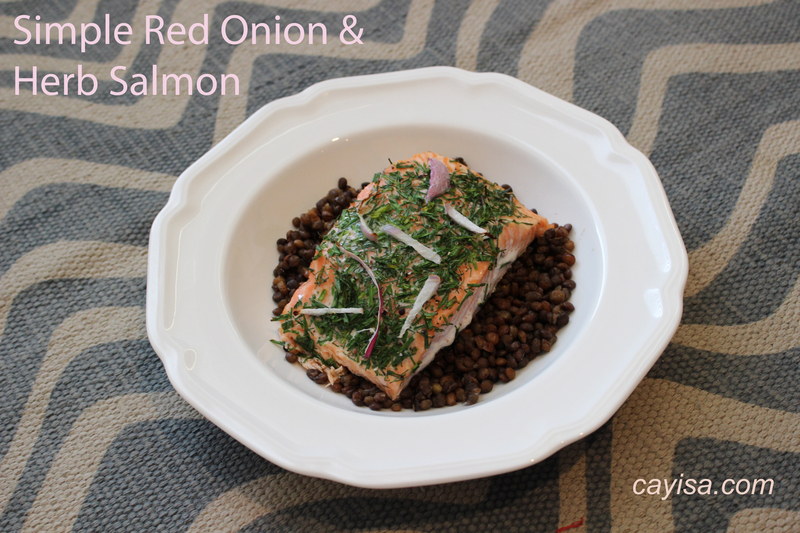 Cover salmon in chopped herbs and then top with thinly sliced red onion. 4. Heat in the oven for 25 minutes or until it is cooked through. 5. Before serving squeeze lemon juice on top and serve with lentils or sautéed mushrooms.